When it comes to custom fences, decks, porches, gazebos, pergolas and other structures for outdoor living nobody beats Florida Fence and Deck. Our superbly crafted fences and decks make your outdoor additions a beautiful and secure reality. We combine artistry and practicality to create a space that will surely become THE gathering spot for family and friends. And we create secure perimeters with various types of fencing. Everyone wants a home with a beautiful fence and deck—but not just for present-day enjoyment. It’s a great amenity to feature when you’re ready to sell and it’s always highlighted in property descriptions. Real estate experts say outdoor living spaces are big attractions today because they expand a home’s living area and also allow for escape, relaxation and entertaining. Who can argue? Indeed, a fenced backyard is a prerequisite in some areas for homeowners considering listing their home. So whether you install a new fence for looks, for security or both – it’s true that a good fence not only makes good neighbors, it makes for a happy homeowner as well! 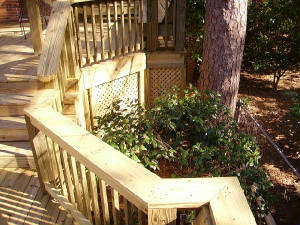 Many contractors are custom fence and deck builders in name only. It's listed on their business cards, but it's not really a specialty like it is with us. Our reputation for quality and attention to detail is truly second to none. Our crews are skilled at creating any style of the most desired and popular fences, decks, arbors, pergolas, gazebos and much more you have in mind. No matter how you live...in a rural house, a suburban split-level, a bungalow or urban townhouse...fences, decks and other outdoor living spaces give you an easy way to extend your lifestyle way beyond the doorway. Take the first step. 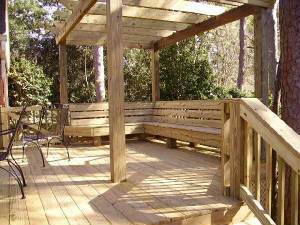 Call Florida Fence and Deck for a free consultation.